eat, drink & be vegan: Sprouter Giveaway! Hometown Seeds is an online company that specializes in high quality garden and sprouting seeds. All of their seeds are GMO-free, and all of their sprouting seeds are certified organic. Hometown Seeds is giving away a Kitchen Crop Sprouter! 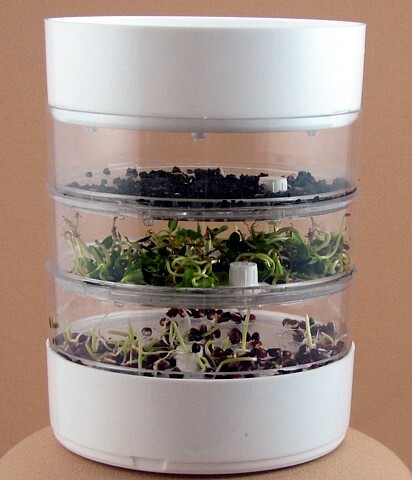 This is a 3-tray sprouter systerm, giving you the option to grow up to three different sprouts at once, straight from your kitchen. What a marvelous way to include not just fresh, but living foods, in your diet as we move into fall and winter months. For your chance to win, simply leave a comment on this post. One comment per person, and contest is open to Canadian and US residents. oh, this would be lovely! I've always wanted a sprouter!! I would LOVE a sprouter! Great giveaway! I've always wanted to try sprouting my own sprouts!!! This is cool and looks like it takes very little space. Wow this is an awesome giveaway! I've wanted to buy a sprouter for a while now!! Haven't sprouted for years. Would be good to get into it again! Oh wow this would simplify my life like no other! That looks pretty awesome, and fool proof. I just had sunflower sprouts for the first time today and would love to be able to make my own at home! I would love to have one. I was actually shopping for the spouter :) Good luck everyone. Oh, I've wanted one of these for a while! how cool! i'd love to try that out. this looks awesome! I totally need to get rid of my big jar. That would be a fabulous prize!! Have tried to sprout, but no luck. We really love being vegan and sprouts would be an awesome addition!!! YAY! YAYAYAY! Sprouting rules! This will surely be superior to the old school mason jar method. More mason jars to fill with smoothies! More sprouts for all! I have wanted one of these for so long! How mom-of-four-boys-six-and-under friendly is that!? What a wonderful change that would be from my mason jars!!! I have tried two different sprouting systems, and often had poor (moldy) results. This one looks awesome and well built. I'd love to try it. Wow, this is more high tech than my mason jar setup. I'd love this! i have always been curious about sprouting and i think this would make it MUCH easier! I need to get back into sprouting! I would love love love to win this sprouter! I've always wanted to sprout and this would help me do that. Pea shoots are my favorite :). Ah, this would be great! I love sprouts! This looks great because it's all enclosed....especially valuable in warmer, tropical (read "buggy") climates. I tried sprouting in a jar on the counter and just grew mold... this seems like a better way! Would love to sprout at home! I am just starting to learn the loveliness that is sprout-eating, and want to make that magic happen at home. Thank you for your contest and your consideration! Three at once and taking up less space, that would be nice! Thank you! oh this would be so lovely!!! I've been sprouting bunches lately!! Oh, more sprouts all at once! This would be so much better than what I can do with my little jar! ooh, i've had my eye out for something like this. looks fabulous! Oh, please enter me! I would love to grow my own sprouts! I too think this is a wonderful giveaway! I've sprouted in the past using an old pickle jar, a perforated lid that doesn't fit the jar, and a supermarket produce-recycled rubber band. It works, but it would be lovely to have a proper sprouter to work with. I'd love to try this out. Maybe the beautiful container, and the fun of growing something from seeds, will finally convince my little sister to try sprouts. Ooh, this would be nice to have! ooh... I would love to win this! It's much prettier than my current method of sprouting, which involves an old colander and a tea towel!! Wow, I would love to try this! This is just the thing I need!!! !Please count me in too! What a great giveaway! 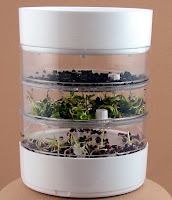 I would love to try out sprouting with one of these! Oh my gosh! I spend so much money buying sprouts and have been dying for a sprouter like this! My fingers will be crossed until you announce the winner! That looks neat :D I'd be glad to throw more greens on my greens! Ooh, I have been wanting one for ever. Great contest! That looks so awesome!! I would love to have one in my kitchen. I've been experimenting with sprouting lately.... this would make it sooo much easier! Love this! Way better than my mason jar! I also think this would be great for a school lesson - I would definitely loan it to my daughter's classroom to try out. Want! :) I have tried sprouting in mason jars before but it gets a little funky. I've always wanted to try sprouting! Oooh - I would love this! We've tried various "homemade" methods of sprouting but haven't been pleased with any of them ... this system looks fabulous! I would love a sprouter! How fun! I have been wanting to learn how to sprout for quite some time. Thank you for hosting such a generous giveaway! That sprouter looks so handy! I'd like to have one! It's been so long since I've sprouted - I would love to win this! What a great giveaway!! I've always wanted to try sprouting! I have been wanting to grow sprouts! What a neat idea. I've never seen one of these. Thanks! I have always wanted to sprout--this would be amazing! This looks great! Would love to give it a try. We eat broccoli sprouts everyday so I'd love to win that sprouter and save a little on the grocery bill! This looks great. I would love one! hooray for the giveaway! This is such a good idea for eating more sprouts :D I'd love to have one. Wow this would totally be at home on my kitchen counter! What a great contest! I have been meaning to try sprouting seeds for the longest time but have never managed to get myself organized enough to give it a shot, this would make it so much simpler! we use this wonderful little guy almost daily- it's such an amazing little addition to our kitchen. and it's easy. It's a perfect fitting for you two to give it away! That looks like a really cool device! It would be such a great addition to my kitchen! Yay sprouts! This is such an awesome giveaway! I've looking to get something like this, but couldn't quite decide what would be best. I would absolutely love to win one!! a 3 tray sprouter??? Wow....that would be much better than one tiny batch at a time in my tiny little jar,haha! Great giveaway - do you have any recipes to go with the sprouter? Winning this would be SPROUTacular! I always think about sprouting, and used to do it often, but I never seem to make time for it anymore. Maybe this nifty sprouter would push me to get to it again! This would be incredible! My son would love watching the seeds sprout and then tasting them!